...That Our Signs Can Be Customised To Your Requirements? Health and safety signs are usually standardised across all areas of the organisation, no matter what environment you work in, fire exits have to be signposted; hazards have to be highlighted and everyday guidance signs are required to direct employees to the appropriate equipment. However, here at Slingsby we can also customise signs to meet your needs. We can help you with the design and the appropriate material to use and can supply signs such as front of house reception or entrance signs, directional signposts or notice boards and even LED displays for both indoor and outdoor use. Alternatively if your warehouse needs an overhaul, you will find a wide range of markers and identification labels which can be supplied in any format you require, to fit in with your own business inventory and stock location system. 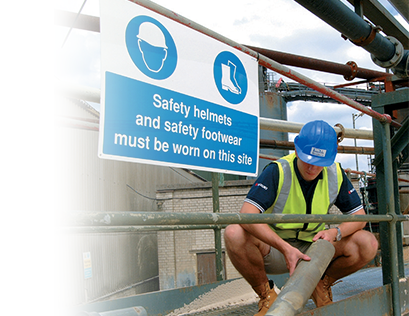 Under The Health and Safety (Safety Signs and Signals) Regula­tions 1996, employers are required to provide specific safety signs whenever there is a risk that has not been eradicated by other means. However, a major piece of new legislation that is on the horizon is the further standardisation of all safety signage throughout Europe. Due to the growing number of non native speaking employees, text based signs are being replaced with standardised signs featuring internationally recognisable and consistent symbols. These changes will see ISO 7010, become BS EN ISO 7010. This will be a major shake-up of legislation sur­rounding safety signs and although the introduction date is still to be confirmed, it will affect nearly all workplaces. Walk around your entire site and note all your existing fire and emergency exit signs. Are they in appropriate places and are they guiding you to the closest exit? Look at specific hazards and ask whether the warning signs are clear and sufficient. Pay close attention to areas where changes have been made, such as decorating work or the rearrangement of furniture, which could affect how signage works. Check all existing signs are clean, clear and easy to read. Generally safety signs containing just text are not permitted. Instead they must also include a pictogram and be a specific shape and colour. Finally before ordering any signs, it’s important to check they comply with BS EN ISO 7010. Otherwise they could have to be replaced again almost immediately. All of our signs comply with the new BS EN ISO 7010 regulations. Your guide to Safety Signs. Prohibition - A red circular band with diagonal cross bar on a white background, indicates that a certain behaviour is prohibited. Warning - A yellow triangle with black border and symbol within the yellow area gives warning of a hazard. Mandatory - A blue circle with white symbol indicates that a specific course of action must be taken. Fire Equipment - A red oblong or square with symbol in white indicates the location of fire fighting equipment. Safe Condition - A green oblong or square with symbol and text in white provides information about safe conditions. Multi Purpose - A combination of sign types which conveys a dual message. Aluminium - Often used in prestigious areas such as receptions or hotels to give a high impact, high quality look. One of the more expensive materials which can be used both internally and externally. Rigid PVC Plastic - This is the most common material that signs can be made from due to its cost effectiveness and durability. Can be used internally and externally. Self Adhesive Vinyl - Low cost, easy to fix solution. It simply peels off and sticks to the wall. This will cope with most surfaces, including curves, and is easily removed. Reflective - Class 1 or Class 2 reflective surfaces bonded to aluminium. These can be fixed to posts or walls for internal or external use and are mainly used in hazardous or high traffic areas to increase safety awareness. Polycarbonate - One of the most durable materials. It is impact, vandal and abrasion resistant but also one of the most expensive materials. It can be used for internal and external applications and has a high quality finish. Photoluminescent - Enables the clear identification of escape routes, hazards and safety equipment in dark or poorly lit areas. Tapes and signs have an exceptional excitation at low light levels and are activated at only 25 lux.